Click HERE to check our jade products. Jade comes in many colours - from green-blue to white,is said to bless whatever it touches, serving mankind across the globe for nearly 6,000 years. Jade has been the most highly esteemed stone in China throughout recorded history, and was valued for its beauty and powers of healing and protection. Jade is a powerful cleansing stone, enhancing the body's filtration and elimination organs. It is cherished as a protective talisman, assuring long life and a peaceful death, and is considered a powerful healing stone, an amulet of good luck and friendship. Jade signifies peace through strength, signifies wisdom gathered in tranquility, dispelling the negative and encouraging one to see oneself as they really are. Jade is a crystal of love. It is supportive of new love, and increases trustworthiness and fidelity. It also inspires love later in life. Jade is the stone of calm in the midst of storm. A piece of Jade kept in a pocket or on a pendant to stroke from time to time recharges energy, and traditionally guards against illness. Jade may also be used to temper the shock or fear of the very young or very old being cared for in the hospital or away from home and family. In feng shui, jade has been used for centuries for its abilities to create a serene feeling of harmony and balance. Jade is also used as a protection and good luck feng shui stone. Taiji has been shown to decrease stress, increase muscle strength in the lower body, and improve balance, posture and the ability to move. Taiji Gongfu Fan is an internal art, combining elegant Taiji moves with Fan technique. 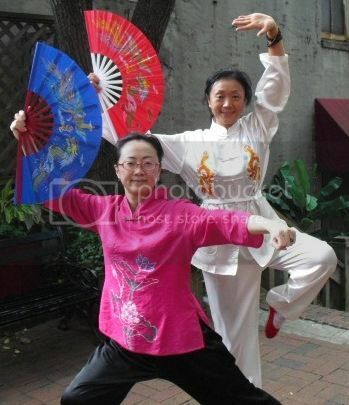 The fan is a Chinese symbol of royal power and is considered to be one of the great weapons in martial art. Thursdays 5:30-6:00pm and Sundays 5:00-5:30pm. Place: Inside the Downtown Cotton Exchange building Scoop, T.S. Brown Jewelry outdoor area or the area in front of Ping’s Tibet. This is the one we will practice. You can practice with the fan or without the fan. Ping's Tibet Has a New Store! We have moved our store to a bigger space which is right next to our old store in the Cotton Exchange. We have fresh made delicious fudge and new hair clips, tea sets, Feng Shui fountain and more. Come and visit us, have some tea and try some fudge!